Maggie Walsh was born in New York City in 1899 to Irish immigrant parents. She was named for her mother Maggie (Margaret Langan). She was the third of ten children - my grandmother's older sister. She grew up on the upper east side - in the 80s near 3rd avenue. She became a secretary and worked on Wall Street in several brokerage houses for over 30 years. She married Lou Petersen when they were both in their 40s. They did not have any children. There were a number of Margarets in the family in the generation after Maggie was born. Interestingly they were all nicknamed Peggy, instead of Maggie. I was named Marguerite - a variation of Margaret. From a very early age I was called Maggie, most likely in honor of my great aunt and my great grandmother. Maggie Walsh Petersen was the proverbial eccentric aunt to her numerous nieces, nephews, grand nieces and grand nephews. She lived in a narrow red brick, four story row house at 16 Moore street in lower Manhattan. 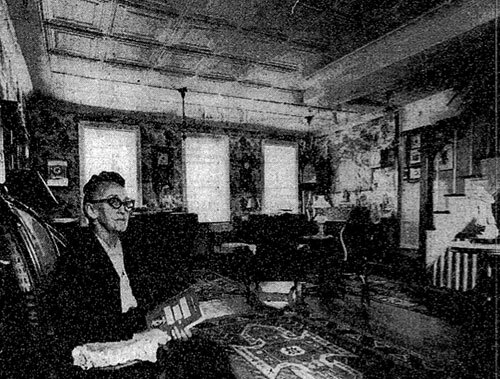 According to a 1965 newspaper article Maggie and her husband, Lou Petersen, bought the house at 16 Moore street in 1953. Her house was filled with hundreds of clocks all ticking and tocking and chiming and bonging at different rates and different times. She drank pots of tea with lots of milk. When I was a kid I thought she was offering me a "weak" cup of tea. Later I discovered it was a "wee" cup of tea. Apparently older guests got bourbon. A trip to visit Aunt Maggie was always a treat. First there was her house. It had a kind of store, that was usually unoccupied, on the first floor. The next three floors each had one room. One floor was the living room, another the kitchen-dining room and the top was Maggie and Lou's bedroom and bath. The clocks were everywhere. She always had some small treasure to show or give as a present. Then there was the neighborhood. It seemed like no one else lived on her street. It was always windswept and deserted. She liked to take visitors on walks around the area, which she dearly loved. The waterfront, Battery Park, the old Customs House, Bowling Green, Wall Street, Trinity Church, Maiden Lane, Fraunces Tavern, the Seamen's Institute, the shrine of Mother Seton, the site of the first wharf in Manhattan near Pearl and Broad, the old Army Building, Coenties Slip, Jeanette Park, the Stock Exchange - she would tell the history of all of it. By the late 1950 lower Manhattan was economically depressed and the city attempted to consoldate property near Battery Park under eminent domain to build public housing. That plan fell thought. The next idea was to build an office building to house the New York Stock Exchange on the site. The area in question encompassed the six blocks from Coenties slip in the north, Whitehall in the south, South street in the east and Water Street in the west. Maggie Walsh and Lou Petersen's home was east of Water Street, between Water and Front on the south side. Almost, but not quite, in the middle of the proposed area. Sol G. Atlas and John P. McGrath were business partners who owned several blocks in the area. They did not want to loose their property to eminent domain. John P. McGrath, a lawyer and a former city corporation council, and Sol G. Atlas, a real estate developer, sued the city, claiming it had "no right to condem private property for public use." Their suit was successful and they retained ownership. Maggie and Lou sued to retain their home. They lost. But Maggie did not loose her voice and she continued her battle agains the razing of her house until at least 1967. She wrote tons of letters to everyone and anyone she though might have some influence. In a quite but firm tone she would protest to whoever would listen. She managed to get interviews with newspapermen and TV reporters. She encouraged all of her numerous nieces, nephews, grand nieces and grand nephews to write to their congressmen, senators, the mayor of New York, the governor, and even the president of they United States - pleading for the preservation of historic lower Manhattan. She had sheets of paper at the ready listing everyones contact information. She would hand out several to everyone present and more than once encouraged me to get my friends and classmates to write. By the early 1960s the plan was for the New York Stock Exchange to build a new trading floor and a 43 story office building on the site which encompassed about 6 square blocks including the block of Moore street where Maggie's house stood. Numerous reports stated: "the city offered to provide the stock exchange with a new home in the area through the use of urban renewal funds". In March 1965 while the Atlas/McGrath suit was still unsettled McGrath made a proposal to the city to widen Water street. This meant that the city could condemn any property that lay in the way including 16 Moore street. Maggie sued the city to try and prevent the widening of Water street. Again, she lost. Atlas and McGrath successfully argued against the Urban Renewal designation and were allowed to build a 50 story office building in the six block area original designated in the low income housing proposal. Among the tenants were: Salomon Brothers, Goldman Sachs, Morgan Stanley (multinational investment banking firms), and Fried, Frank, Harris, Shriver & Johnson (a wealthy law firm). Maggie repeatedly stated that David Rochefeller and the Chase Manhattan bank didn't have enough money to buy her out. David Rockefeller did not really want to buy her out but he was one of the prime movers in the redevelopment of lower Manhattan. He build One Chase Manhattan Plaza, the headquarters of the Chase Manhattan bank of which he was chairman and chief executive. One Chase Manhattan Plaza, a 60 story skyscraper, was completed in 1961. See New York Architecture Images- Lower Manhattan CHASE MANHATTAN BANK TOWER. Ironically the building received an Historic Landmark designation in 2008 - thus perserving the building whose prime mover was one of Maggie's prime opponents in her fight for historic preservation. 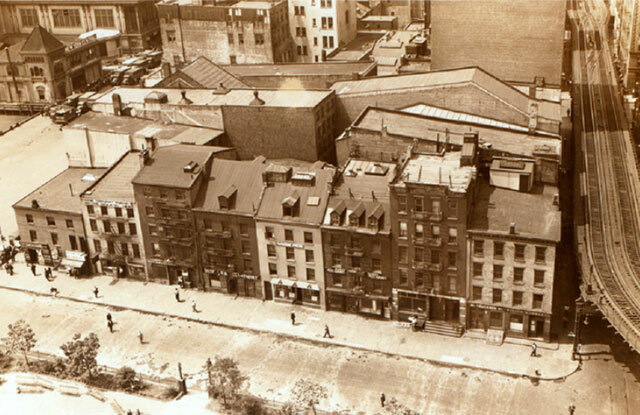 In a press release from "Americans to Preserve Historic Old New York Including The World - Famous Seamen's Church Institute of New York" addressed from 16 Moore Street and dated May 31 1957 the area under consideration was listed as "South Street to Water Street 2 blocks Whitehall Street to Coenties Slip 3 blocks". It was said to be the designated as a COMMERCIAL SLUM but Maggie claimed it was the locality of old established businesses like ship chandlers, marine suppliers, and coffee processers and the Seamen's Church Institute at 25 South Street. "Maggie Walsh Petersen, implacable foe of builders who destroy historic relics in the city, has more than 200 ancient clocks in her quaint century-old brick house at 16 Moore Street, just off the downtown waterfront. The dwelling is heated with old woodstoves and most of the furnishings are from one to two centuries old. Coziest spot in town, even in a freeze. The moment you cross the threshold and the door closes you have stepped from the twentieth century into the early nineteenth." "Oh, yes! people have been trying to buy my house. But there's not enough money in the Chase Bank, and David Rochefeller (he's the president of the Chase Manhattan Bank) and all his brothers put together haven't got enough money to buy this place. In a sense it doesn't even belong to me. It belongs to the history of the American people"
"every time they demolish a historic building or a bit of old New York to make way for one of those modern glass and steel buildings, or a tunnel, or highway or to widen a street"
"An angry urban renewal fight is shaping up over the plan to build the New York Stock's Exchange's new headquarters on land acquired through condemnation by the city." Sol G. Atlas the "biggest owner" in the area objected the city's urban renewal plan. He reportedly owned 3 and a half blocks of the "seventy" block area which he proposed to sell for a reasonable price. If the city eased zoning it was enough for a 40 story office building. On behalf of Mr. Atlas, John T. McGrath made several proposals all coming down to the idea that Atlas build the building and the Stock Exchange become the tenant of Atlas. Another clipping I have from November 24, 1963 is from the Indianapolis Star entitled HISTORY'S HOME IN "SLUM" by Jane Allsion. It repeated much of the June 9th article. It did state that David Rochefeller, president of the Chase Manhattan Bank, was "a neighbor of Mrs. Petersen, and a leader in the Downtown Manhattan Association which is replotting for business reasons all of downtown Manhattan." Maggie's fight was picked up by newspapers all over the country and I remember seeing her on TV occasionally during this period. These articles indicated that Maggie was pretty much alone in her fight and that her letters to various officials, including President Kennedy and New York City Mayor Wagner, went unanswered. The articles talked about her clock collection and the coziness of her home. "its power of condemnation to forcibly take the property of those owners who would not sell out to them. Then ... these same parties told the city to keep the part the city 'needed' for city street-widening and to sell the remainder of these properties to them as 'remnants'." Maggie, her house, and clocks were featured in this article. There is also a photo of Lou Petersen, Maggie Walsh Petersen and Sadler Morgan. I have a copy of another press release from the Americans to Preserve Historic Old New York Including The World - Famous Seamen's Church Institute of New York" addressed from 16 Moore Street and dated August 16, 1965. It mentions "picketing" of the U. S. Army building at 39 Whitehall street and the burning of draft cards in protest to the Viet Nam War. Maggie was presenting the idea that 39 Whitehall should be turned into an Army Museum. The Daily News of September 16, 1965 ran a one page article (with images) entitled HER HOME IS A CASTLE EVEN STOCK EXCHANGE CAN'T BUY by Kitty Hanson. Much if it is a rehash of other articles but it does mention for the first time the partnership of Atlas and McGrath and the fact that they had a suit against the city claiming that the government had no right to condem private property for private use. Atlas and McGrath were said to own about 65 precent of all the property in the area in question. The previous March they had sold the eastern two block section to the Exchange "for its new trading floor." They were planning a 43 story office building "where the exchange could rent office space." Despite Maggie's refusal to sell, McGrath was rapidly moving ahead with demolition on the property he owned. "And he needs Mrs. Petersen's house and the other properties in order to build his office skyscraper in accordance with the city zoning laws." On November 1, 1965 the New York Times ran an article by Edward C. Burks "WOMAN FIGHTING TO SAVE HOME NEXT TO BATTERY FROM WRECKERS" contains a few new tidbits. "The Dutch built one of the city's earliest docks at the foot of Moore street." Maggie called the area New York's Plymouth Rock. There were three other homeowners who had joined Maggie in the fight. They were not named. John P. McGrath and Sol G Atlas hoped "to win their battle through condemnation proceedings by the city." They already owned 93% of the six block site. "The City Planning Commission and Board of Estimates after public hearings, would have to vote to carry through a long-considered plan to widen Water Street and close off Moore and Front streets. The Water street project would lead to condemnation proceedings against Mrs. Petersen, and the owner of a 12 story records warehouse, another holdout, because their buildings would project into the bed of the widened street." Maggie had been unable to interest a foundation in the restoration of her block of Moore street which she claimed would have made a great tourist attraction. The city's Landmarks Preservation Commission had formally encouraged the Board of Estimate to relocate four buildings (at 45, 47, and 49 Whitehall and 2 Front street) to the block which housed Fraunces Tavern. Despite the dilapidated condition of the four buildings in question they were deemed "fine private residences of distinguished architecture". Maggie's house was not given the Landmarks Commission blessing but the head, Mr. Van Derpool, conceded "that the Petersens have done more research on the age of their house than the commission" had. It was claimed that at the head of Moore street lay the city's first custom house built by the Dutch "and its first market authorized in 1656 by Peter Stuyvesant. The plan still called for making two "super blocks" from six small blocks and building a 43 story new home for the New York Stock Exchange. 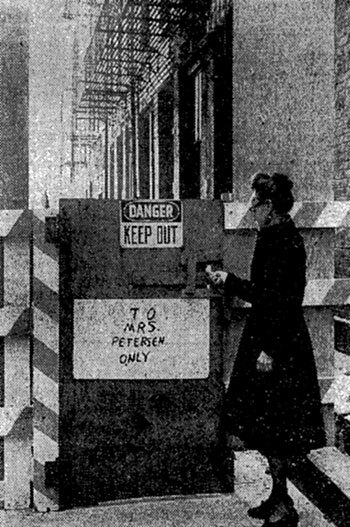 Maggie was still holding out in November 1966 when the New York Times ran an article with pictures, including one of a private gate to the Petersen house with a "DANGER KEEP OUT" sign and another reading "TO MRS PETERSEN ONLY". 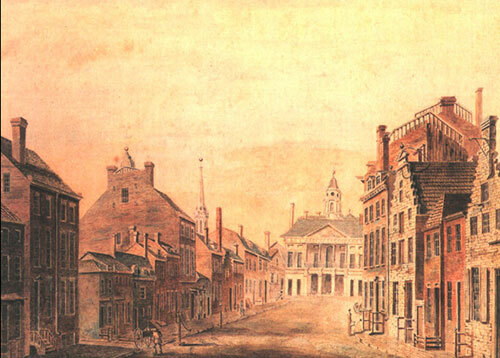 Maggie had lost her fight to save her own house but the Landmarks Preservation Commission did decide that three old buildings on Whitehall Street and one on Front street which dated from 1790 to 1820 should be saved and relocated to the same block as Fraunces Tavern a short distance away. Maggie claimed that no one from the Landmarks Preservation commission would inspect the inside of her house despite her invitation. She was told that no one needed to come into her house "to judge its age, that architects could tell from the outside." "Moore street in front of Mrs. Petersen's house, now looks like something out of London's wartime blitz. It has been closed off since the wreckers began assaulting a 16 story building across from the Petersens home and the street is full of debris and chocked with dust." McGrath stated "Mrs. Petersen is going to be evicted." He estimated that the entire block would be cleared by the following spring. Maggie's lawyer, Reuben Gross, had a appeal hearing before the Supreme Court and until that time, the demolition crew could not raze her house. Her house was still standing in the summer of 1967. That was the summer I got married and my fiancee, Tom, and I went to visit her. At the time the house was reachable only by a cat walk across the middle of a hugh excavation pit that was surrounded by a construction fence. Most of the buildings on the block had already been razed. I don't know when she was forced to move out. However, by December 1969 she was living at 5 Stone Street. Family stories relate that as the demolition around her progressed to the point of her isolation on an island in the middle of the hugh hole the water, gas, and electricity were shut off and the house was condemned. Family gossip also holds that in the end Lou and Maggie got a "pretty penny" for the house. "Moore Street, or most of it was gone. In its place was a gaping excavation covering a good four blocks"
"President, cabinet officers, members of Congress and various industrial moguls, telling them the march of progress, so-called, is rapidly destroying landmarks that can never be replaced"
Most often her letters were turned over to an agency. "Nothing like a nice letter from Urban Renewal", says Maggie, "when my my object is not to "renew' anything. I merely want to conserve the few treasures we have left so that future generations of New Yorkers can enjoy them". This article also mentions her clock collection. In 1973 Maggie was mentioned in Love of Earth by Herbert Eliot French. A typical contemporary example of a wonder that disappeared overnight in the course of supercity immediate - construction was the home of Ms. Maggie Walsh Petersen at 16 Moore Street. It was a 1732 structure which she described in 1963. Dailey News, Thursday September 16, 1965, Mrs. Maggie Walsh Petersen, arms outstretched, guards her pre -Revolutionary home at 16 Moore st. for real estate intersts seeking site for proposed new office skyscraper. The three windows are at the front of the house facing Moore street. My Comments On The Age Of Maggie's House. It is hard to know if Maggie's house really dated to 1734, as she claimed, but it does not seem likely. The Castello Plan, a 1660 map of New Amsterdam, clearly shows what later became Broad street - it was a canal in 1660. Another street (now lower Broadway which has more or less remained the same) ran from the wall (now Wall street) to the Bowling Green. The area around what was later Maggie's house was inhabited in 1660 but the street plan was not the same as shown in later maps. A view of lower Manhattan in 1756 does not show any houses in the shape of Maggie's four story narrow row house. A map dated 1857 shows a building at 16 Moore Street. Later maps show more or lesst the same configuration of building on Moore street between Front street and Water street. The houses with the stepped gables facing the street remained from the Dutch period. The other buildings with pitched roofes facing the street are from the English period. None of the buildings in these two images have the flat roof of Maggie's house. However, it is possible that alterations were done at some time. 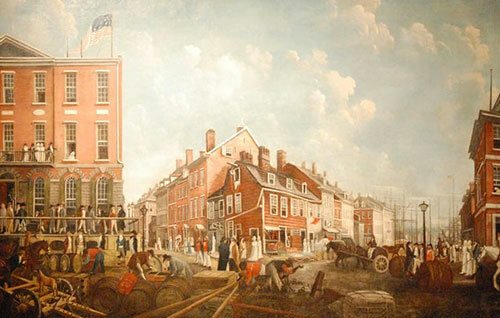 Fraunces Tavern had a long history dating back to 1730. After a fire in 1854 in which the roof burned, the building was altered and subsequently looked like a typical Victorian structure with no hint of any earlier architectural period. Daytonian in Manhattan says that "prior to the 1907 restoration the 18th Century structure was totally hidden." The restored Fraunces tavern is typical of the buildings that were in the area at the time of the American Revolution. Coenties Slip was not yet land filled. An unnamed open basin south of Coenties Slip which would later be the block between Coenties Slip, Front Street, Broad street, and Water street was not yet land filled. There was an unnamed slip at the river on what would later be Broad street. What was later South street was labeled "East River". What was later called Front street was labeled Water Street. What was later Water Street was labeled Dock street. Moore street was in existence but not named. Whitehall street was labeled Whitehall street. I cannot get a good reading of the information which is included in the various blocks of the plan. By 1834 several images do show houses in the area with the general configuration of Maggie's house at 16 Moore Street. Multi storied "boxes" with the windows of the lower floors slight taller than the windows on the upper floors were common by the mid 1800s. These building in the above image are more in keeping with the style of Maggie's house as it was in the 1960s. Also at the same time, those four brick houses Nos. 10, 12, 14 and 16 Moore street, three stories high, recently build, and good situations for business - No. 10 being the corner of Water street and Moore street. In the spring of 1821 the property was again for sale - listed as "The house and lot, No. 16 Moore street occupied by Capt. Richard Churchward. Richard Chruchward was listed in ward 1, Manhattan in 1820. In March 1819 Richard Churchward was the master of the regular packet schooner Tell-Tale bound for Norfolk. In September 1822 he was the master of "the elegant new steam brig New York bound for Norfolk. Capt. Richard Chrurchward age 35 [?] died June 6, 1834 residence South 2nd street Williamburgh (Ancestry newspaper extracts of deaths). 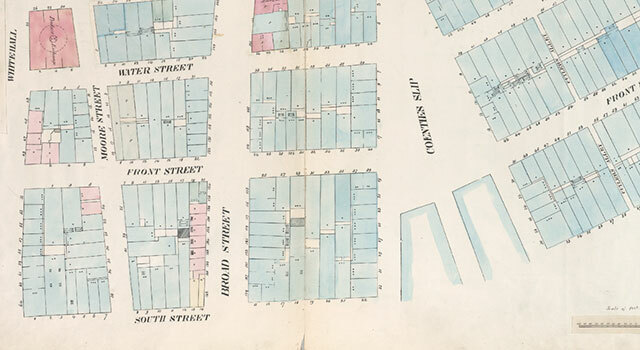 A 1850s map of lower Manhattan shows the blocks between Coenties slip, Whitehall street, South street and Water street with the same configuration that they subsequently had in 1858 and later maps. The 1850 map was the earliest I could find. A map dated 1855 indicates a building at 16 Moore street. According to the reference guide if was a brick or stone building. A map dated 1857 indicates a building at 16 Moore street. According to the reference guide it was a second class brick or stone "store". A map dated 1885 indicates a brick building at 16 Moore street. There are no indication of plot size or number of stories. A 1911 map indicates that the building was a 4 story brick. By 1916 it was the only "house" on the block. One building at 10, 12, and 14 Moore street was 66 feet on Moore street and 24 feet on Water Street and was the Swedish Immigration Home. No. 18 at the other end of the block was one building which measured 49 feet on Moore street and 31 feet on Front street. All the buildings on the block were of brick. "This arrangement continued until the late 1890s when Pastor Sward, who was now President of the Augustana Synod, helped establish an Immigranthemet (immigrant house) that was owned and operated by the Synod. Two small, adjacent houses on Moore Street were rented which provided a total of eighteen rooms. Here, the seafarers were provided with small, clean rooms, and wholesome meals. By 1896, the Immigranthemet was serving more than 40,000 Swedish newcomers a year, and additional space was needed. It was agreed to rent the building next door at No. 5 Water Street at a cost of $50 per month." 16 Moore street is the shortest building on the block. A view of South Street. The Seamen's Institute is the tall building in the center. In front of it is Jeanette Park. Old undated map of the area. The red building at the top left is the Army Building. Counties slip and Jeanette Park are in the wedge shaped area. Maggie's house was in the block of Moore street between Water and Front streets. Jeanette Park and Coenties Slip still retain the same foot print. There are several reverences in the articles to Maggie's parents having stepped off the Ellis Island boat onto Moore Street. 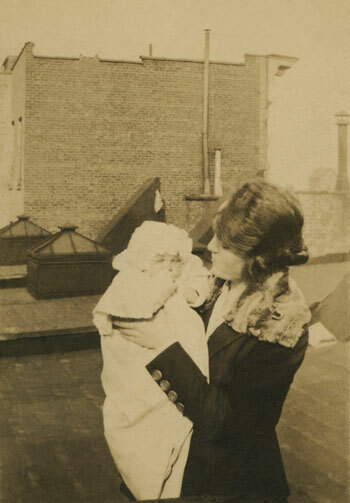 Maggie's mother, Maggie Langan, arrived in NYC before Ellis Island opened. Her father entered the US through the port of Philadelphia. Her grandparents, Mathias Langan and Penelope Byrne Langan did arrive through Ellis Island in 1892. They may have walked up Moore Street but they kept going. Their first known address was in the 20th on the East Side. The extensive Walsh family was in the 70s on the East Side from the late 1880s. 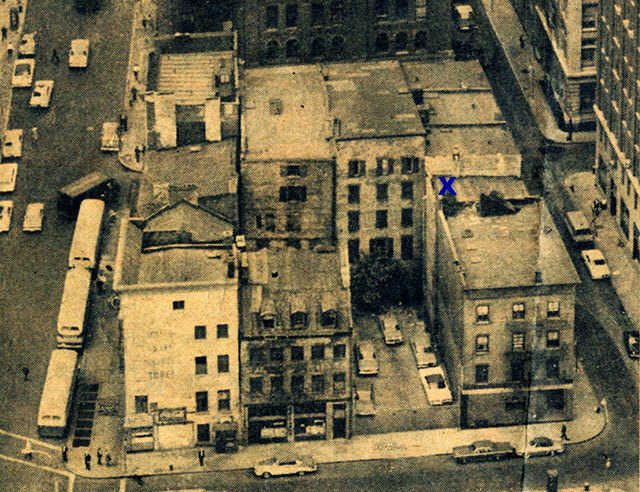 In 1965 it was reported that Sadler Morgan owned a warehouse at 39 Water Street. Sadler Morgan was born circa 1930 to Charles Donahue Morgan and his wife, Isabel Sadler. The family lived in Scarsdale in 1940 and Charles was listed as an executive in cold storage. E. Sadler Morgan was president of Morgan & Brother from 1976 to 1986. In 1976 Morgan & Brothers was one of the largest warehouse and storage companies in New York and was a member of Allied Van Lines. 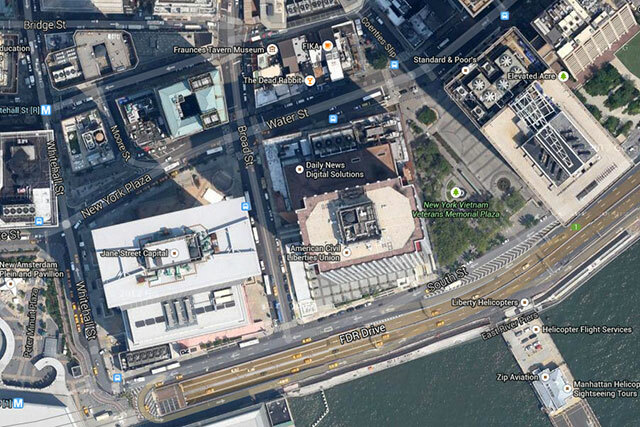 Their main warehouses were on West 47th street. See Morgan & Brother for a history of Morgan & Brother Storage Co. Manhattan. In 1865 Alfred Munroe, merchant broker and commission merchant was located at 39 Water Street, New York. In 1867 Foster, Copeland and Co., Commission Merchants 39 Water Street, New York were advertising cash advances made on consignments. In 1890 J. D. W. Sherman was located at 39 Water Street, New York with storage of 66,986 gallons of fruit brandy (Report of the Commissioner of Internal Revenue By United States. Internal Revenue Service). The only air-tight Special Bonded Warehouse in the world. Fire proof with Iron roof and shutters and glass windows. Heated by hot-air engines, giving an even temperature the year around, thus insuring rapid development and high proof, and yielding the best possible results at the end of the bonding period. Cooperage cared for. Storage and insurance the lowest. Freights advanced, and your business carefully attended to. Loans negotiated and sales made for cash when requested. NO. 39 WATER STREET, NEW YORK. In 1903 the wholesale tobacco company of Moore & Calvi was located at 39 Water Street, Manhattan. In 1906 there was still a tobacco warehouse at 39 Water Street, Manhattan. In 1919 American Architect and Architecture announced that Baker, Carver & Morell 37-39 Water street, New York received bids for altering an eight story brick and steel warehouse. They were listed in 1920 as ships chandlers. Joseph B. Morell of 39 Water Street, New York was listed on the board of trustees of the American Seamen's Friend Society in 1918. In the end it wasn't really David Rochefeller, the Chase Manhattan bank, or the New York Stock Exchange that drove Maggie Walsh Petersen out of her home at 16 Moore street. It was Sol. G. Atlas, John P McGrath and One New York Plaza who did Maggie in. In 1967 Sol G. Atlas and John P McGrath were in the process of building the "world's largest investor built and owned office building" at One New York Plaza. The building is listed by Brookfield Properties as build in 1970 and renovated in 1994. It is 640 feet tall with 50 floors. Sol G. Atlas died of a stroke in August 1973 age 66. His obit stated that Atlas and his partner John P. McGrath, built the New York Plaza near the Battery which included two skyscrapers - a 40 and a 50 story buildings. The "fire proof" building suffered a fire in August 1970 only a short time after it opened. Two men died. Many other suffered from smoke inhalation. Three stories were consumed at an estimated cost of 10 millon dollars. See Popular Mechanics for a detailed story with images. In June 1976 4,000 office workers were evacuated from the 17th to 50th floors at One New York Plaza when a fire broke out in an electrical closet on the 43rd floor. In February 1991 the building got a tax break because it contained asbestos. The former owners of One New York Plaza were granted a 24 million dollar tax refund on the 65 million dollars it paid in taxes between 1984 and 1989. The chief tenants between 1884 and 1989 were: Chase Manhattan Bank, Salomon Brothers, and Oppenheimer & Co. Shea & Gould argued the case on behalf of Sandra Bass and John P. McGrath who owned the building until 1989 when they sold it to Chase. "A RULING in State Supreme Court that sharply cut taxes on a prominent Manhattan office building because it contains asbestos has opened the way for a $24 million tax refund for its owners. Moreover, the decision on Jan. 18 in Manhattan also raises the prospect of millions of dollars in reductions and refunds to owners of many other commercial buildings with asbestos. Although owners have been discounting the value of buildings containing asbestos since the material was outlawed in the late 70's, tax assessors have refused to take asbestos into account in making assessments. Justice Stanley Parness ordered the city to reduce the assessment for One New York Plaza, now the Chase Manhattan Corporation headquarters in Lower Manhattan, by nearly 38 percent because the presence of insulation made of asbestos, a cancer-causing material, reduced its potential sale price, made maintenance much more expensive and frightened off potential tenants, particularly now that rising commercial vacancy rates offer plenty of alternative space." "In the case of the downtown behemoth, One New York Plaza, something like $100 million is to be spent cleaning, restoring, repainting and repairing the facade, redesigning and rebuilding the lobby and the enormous plazas at the tower's base, removing asbestos and renovating the service areas at the building's core. One New York Plaza -- it would more helpfully be called 1 Water Street or 120 Broad Street -- was built in 1969 by Sol G. Atlas and John P. McGrath, to designs by William Lescaze and Kahn & Jacobs. Its 2.3 million square feet of space make it one of the largest buildings in New York. It was in headlines from the start. A 1970 fire killed two persons. A 1984 fire forced the evacuation of the building. Last January, a State Supreme Court justice ordered a reduction in the real-estate tax assessment for the fiscal years 1985 through 1990, which amounted cumulatively to $360 million, based in part on the presence of asbestos insulation. The city is appealing the decision. The principal tenant, Chase Manhattan, is also its owner. Chase bought the tower in 1989 for about $140 million from the estate of Mr. Atlas. "Even in the context of the current market, it represents a great investment opprtunity," said Martin Turchin, vice chairman of the Edward S. Gordon Company, leasing agents for the building. Chase has 1 million square feet, space it is to vacate beginning next year as it moves operations to the Metrotech Center in Brooklyn. Another big tenant, Salomon Brothers, is already moving from its space on the upper floors to Seven World Trade Center. Together with seven floors that are now empty, some of which had been occupied by the bankrupt Thomson McKinnon financial concern, the Chase and Salomon departures will leave 1.7 million square feet vacant. And the building has some liabilities to overcome. By the time Chase purchased the structure, its had suffered under the management of the Atlas estate. "They let the building run down and had a bad reputation as a landlord," Mr. Turchin said. That was not the only drawback. Current promotional material describes it as "classically modernist," but critics have been less kind. It "looks like 50 stories of Otis elevator buttons (or blank TV screens)," said Paul Goldberger in "The City Observed: New York," while Elliot Willensky and Norval White, in the "A.I.A. Guide to New York City," saw "thousands of interior decorators' picture frames" in this "unhappy facade." YET Richard S. Hayden, of Swanke Hayden Connell, architects for the renovation, knew there would be limits. The tower's basic appearance could not be recreated. "The only way you could do it," Mr. Hayden said, "is to pull the skin off and start over again." We are keeping the strong, black base, which is actually granite," he said. As for the rest of the tower, he said, "Rather than having a couple of horizontal and vertical black stripes that break it into a mishmash of proportion and scale, were going to be cleaning it back to the aluminum surface and repainting the building." What is now black will be painted gray, softening the contrast." The 2010 AIA Guide to New York City called it a "behemoth", with and "unhappy facade" and an "all too prominent, dark, brooding office tower". One New York Plaza was heavily damaged in Hurricane Sandy in 2012. Sol G. Atlas was a comercial real estate developer who build the skyscrapers in Lower Mnahattan that dislodged Maggie Walsh Petersen. He also build shopping centers including: Cross County Shopping Center in Yonkers, Miracle Mile in Manhasset, North Shore Center in Great Neck, Essex Green in Orange, N. J., and Connecticut Post in Milford, Conn.. In March 1955 Sol G. Atlas was described at the owner-builder of the $30,000,000 shopping "mecca" at Cross County. Wananmaker's opened at the Cross County Center in the April 1955 to a crowd of thousands. In 1959 Sol G Atlas made a bid to buy Ellis Island from the government who wanted to get rid of it. His bid of $671,000 - despite being the highest - was turned down. He proposed turning the island into an entertainment center with a 600 room hotel, museum, swimming pool, convention center, shops and a promenade. In 1965 under President, Lyndon B. Johnson, the island became part of the Statue of Liberty National Monument. The ellis Island Museum dedicated to the immigrant experience was opened in 1990. He also proposed to demolish Schermerhorn Row and build office buildings on the spot. However, before he could demolish the buildings 11 blocks were declared a urban renewal area for the preservation and restoration of historic areas. 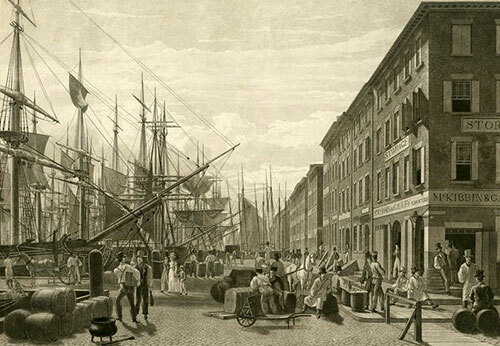 Schermerhorn Row was assigned an Historic Landmark designation and became part of the South Street Seaport Museum. "Mr. Atlas sued to overturn the decision, but withdrew when a transfer of air rights (the unused development potential of a site that can be sold to the owner of a neighboring property) allowed him to build on a neighboring block. But as the office-space market declined, the developer decided against proceeding with construction, and the site was purchased by the city for 8 million dollars. Although this battle against development in the historic district has been won, another still rages on." In the 1940s Sol G Atlas build Park Lake Development at South Franklin St and Graham Ave Hempstead. Sol G. Atlas was born March 15, 1907 in New York to Russian/Polish Jewish parents. Sol Atlas married Edythe Samuels on 8 December 1926.
born circa 1932. She became engaged to J. Alan Ornstein in 1951. In 1955 J. Alan Ornstein worked for Atlas as a member of the Cross County Center Management Committee. Sandra and J. Alan had: Bruce Ornstein, and R. Scott Ornstein and Kathy Jackson. J. Alan Ornstein, a "prominent New York divorce attorney" wrote The lion's share: A combat manual for the divorcing male in 1978. By the time the book was published he was twice married, once divorced and once separated. Sandra Atlas subsequently married Morton M. Bass, a society lawyer, who was born 23 April 1924. Morton Bass died in 2012. Sol G. Atlas died of a stroke in North Shore Hospital in July 1973. He was survived by his mother, his wife, his daughter and three grandchildren. 1910 Census: 4th Street, Abraham Atlas	28, baker, bakery shop, immigrated 1899, Fanny Atlas	27, immigrated 1906, Philip Atlas	7, immigrated 1906, Saul Atlas	3 Mary Atlas	2 Louis Antz	19, brother in law, immigrated 1906 preparer in human hair factory, Sarah Cohen	21, cousin, immigrated 1905, worked in women's waist factory, Max Atlas	24, brother, preparer human hair factory, adults and son Philip all born Russian, other children born US. 1925 Census: Long Island City, Abraham Atlas	42, building, Fanny Atlas	41, Philip Atlas	21, building, Solomon Atlas	18, building, Marion Atlas	17, Rose Atlas	04, Sarah Barbanel	70, mother in law. "Ethel Kennedy (center) standing with Edythe Atlas (right) and an unidentified woman. Mrs. Atlas sent the photograph to Ethel Kennedy with a letter dated March 26, 1963, in hopes of scheduling an appointment for her grandson to meet President John F. Kennedy Kennedy." Edythe Atlas was born 4 April 1910 and died in Great Neck June 1978. John P. McGrath was born 14 January 1907 in New York to Irish immigrant parents. His father Pat and his mother were born in County Leitrim, Ireland and were married in New York in 1902. Pat McGrath died on July 1946 at Marine Hospital in Baltimore where he had been a patient for about 6 months. His obit stated that he had worked for the New York City Fire Department since the early 1900s. He was survived by his widow, five sons, Thomas J. John P., Charles E., Michael, J. and Francis A., and three daughters, Mrs. Mary Hagarty (wife of appellate division Justice William F. Hagerty), and Catherine and Rose McGrath. Anne McGrath age 80 died in 1954 at the Stillwell Nursing Home. Her obit stated she was born in County Roscommon. She was survived by all her children but by 1954 Mary Hagarty was a widow. Catherine and Rose appear to still have been single. Ann McGrath had 17 grandchildren at the time of her death. John P. McGrath attended Eastern District High School in Brooklyn and graduated Fordham Law School in 1926. John P. McGrath married Lucy Patricia Flemming the daughter of Dr. and Mrs. Edward Albert Flemming of Forest Hills at Our Lady Queen of Martyrs Church on November 30, 1940. A reception was held at the Waldorf-Astoria Hotel. The couple honeymooned in South America. John and Lucy had four daughters by 1947: Mary Lucy (1941), Irene Ann (1942), Betsy (1945) and Lucy Joan (1946). In 1948 John P. McGrath, Esq., was with the Brooklyn Law firm of Richards, Smyth, and McGrath. He was also New York's corporate counsel. 1 New York Plaza will have 2.1 million square feet of rentable space and is being built by Sol G. Atlas and John P. McGrath. 1910: Brooklyn ward 19, Patrick Mc Grath	31, immigrated 1894, engineer factory, Annie C Mcgrath	34, married 8 years 4 children, immigrated 1894, Thomas J Mcgrath	6 Mary E Mcgrath	5 John P Mcgrath	3 Charles Mcgrath	1 Anne Cahill	55, mother in law. 1930: Brooklyn, St. Charles Place, own $11,000, Patrick Mcgrath	54, born Ireland, immigrated 1900, stoker, Annie C Mcgrath	53, born Ireland, immigrated 1900, Thomas J Mcgrath	26, assistant manager telephone co., John P Mcgrath	24, lawyer, law office, Mary E Mcgrath	23, stenographer, paints, Charles E Mcgrath	21, clerk insurance, Francis A Mcgrath	18, Catherine M Mcgrath	16, Rose A Mcgrath	13, children all born New York. 1947: The Emerald Association Elected John P McGrath, Brooklyn attorney and chairman of the Democratic county law committee, as president. He was living at the time at 50 Montgomery Place. He was a member of the law firm of Richards, Smyth and McGrath of which Edward A Richards, former Municipal Court Justice, was the senior partner. McGrath had a long list of association and clubs of which he was a member. John P. McGrath, "Lawyer, Banker and Developer" died at age 82 March 2, 1989. John P. McGrath, a lawyer, banker and real-estate developer who served as New York City's Corporation Counsel and as a member of the Waterfront Commission of New York and New Jersey, died yesterday at Columbia-Presbyterian Medical Center after a long illness. He was 82 years old and lived in Manhattan. A soft-spoken son of an Irish immigrant, Mr. McGrath grew up in Brooklyn, earned a law degree at Fordham University and parlayed diligent work for the Democratic Party into a series of posts in politics and public service in the 1940's and 1950's. He was Mayor William O'Dwyer's Corporation Counsel from 1947 to 1951, served as the New York representative on the bi-state Waterfront Commission in 1955 and 1956 and was manager of W. Averell Harriman's campaigns for governor of New York in 1954 and 1958. On the Waterfront Commission, Mr. McGrath helped draft legislation that consolidated its control over the piers, that closed out the last havens for longshoremen with criminal records and that excluded loan sharks, bookmakers and other lawless elements from the docks. Trustee of L.I.U. From 1951 to 1966, Mr. McGrath was a prominent trial lawyer and senior partner of the law firm now known as Fulbright Jaworski & Reavis McGrath. In 1966, he joined the East New York Savings Bank as president and was chairman from 1971 until his retirement in 1982. "East River, south from Coenties Slip (right) to Moore street, showing the shore and skyline of Lower Manhattan. The tower on the left is that of the Produce Exchange building and to its right appears the dome Union Trust Building. 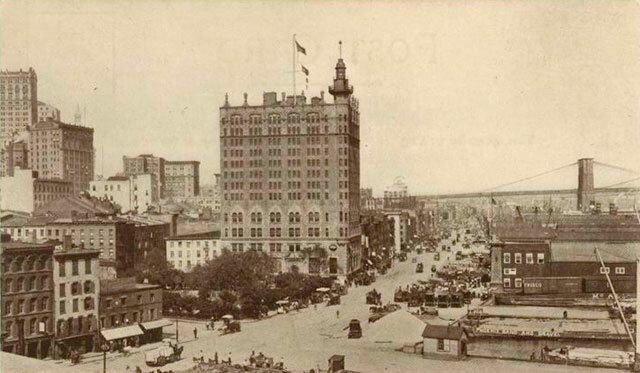 In the center of the view is visible the twin domed Cotton Exchange Building, 1897 Brown Brothers"
Close up of the Moore street end of the above image. 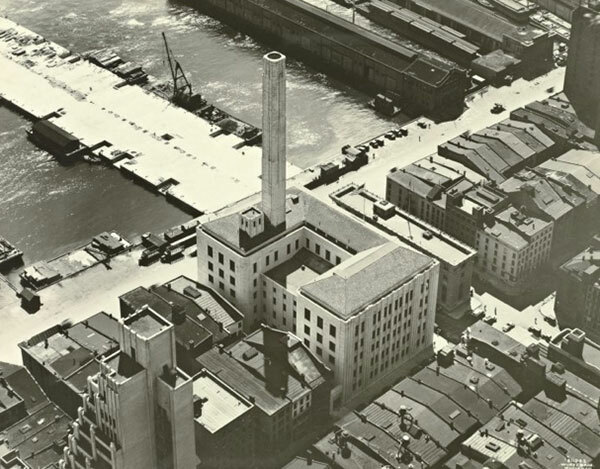 A 1932 ariel view of the East River and South Street showing the Old First Precinct Building build in 1909, the long narrow building (inland from the whitish pier) at 100 Old slip. The white building with the tower was the old Assay Office building. 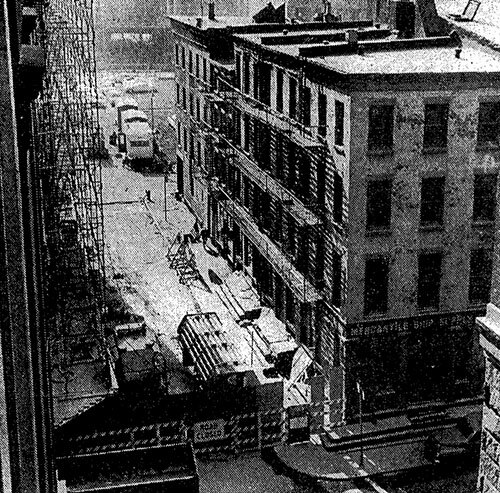 Fraunces Tavern was declared a landmark in 1965 by New York City Landmarks Preservation Commission, and the building's block bounded by Pearl Street, Water Street, Broad Street and Coenties Slip was included on November 14, 1978. On April 28, 1977 the building's block was added to the National Register of Historic Places by National Park Service, and the building was included on March 6, 2008. The Seamen's Church Institute was an Episcopalian maritime mission. The 12 story building at 25 South Street was constructed in 1913. 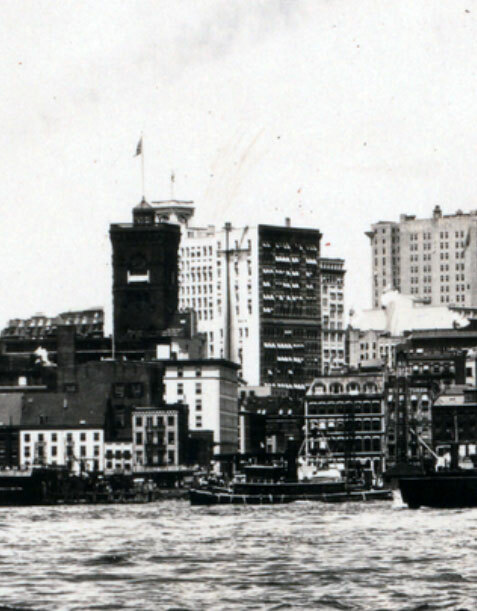 The Institute moved to 15 State street in Battery Park in December 1968. For more information and images of the institution go to Seamen's Church Institute - Fordham University and Seamen's Church Institute. Coenties Slip was an an inlet in the East River. It was filled in 1835. "In 1884 the trapezoidal parcel created by filling in Coenties Slip was named Jeannette Park in honor of The Jeannette, the flagship of the ill-fated Arctic Expedition (1879-1881) sponsored by New York Herald editor James Gordon Bennett, Jr., who named the ship after his sister. In 1946 Robert Moses redid the park and added horseshoe pitches, tennis courts, paddle and hand ball courts and shuffleboard courts. In 1967 the area was designated parkland. 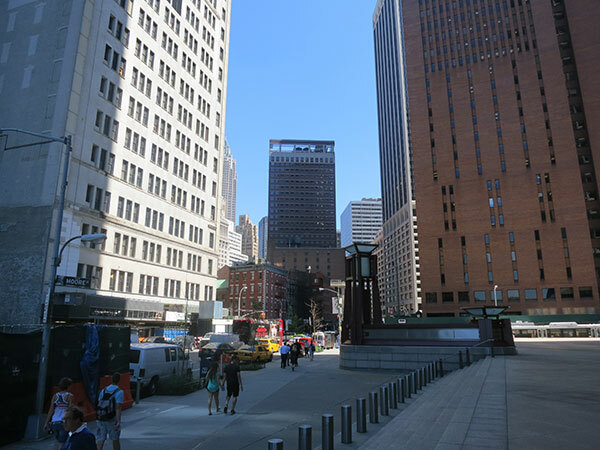 "The owners of the skyscraper at 55 Water Street maintain the site in exchange for receiving permission to build over what was once Coenties Slip." It became the Vietnam Veteran's Plaza in 1982. In December 1963 Cassius Clay was ordered to report for his draft physical at 39 Whitehall street. In December 1967 more than a thousand anti war demonstrators marched on the Whitehall street induction center chanting "Peace Now". About 300 people were arrested. among the was Dr. Benjamin Spock and the poet Allen Ginsberg. The armed forces induction center at 39 Whitehall street closed in May 1972 after 86 years. It had been decided that the eight story red granite, sandstone and red brick building was too costly to renovate after it had been bombed in 1969. The induction center moved to Varick street. Standing just about where Maggie's house once stood, the sign for Moore street is on the left. Straight ahead is the block that was "preserved" which includes the Fraunces Tavern and several other old buildings that typified the area in the pre skyscraper days. 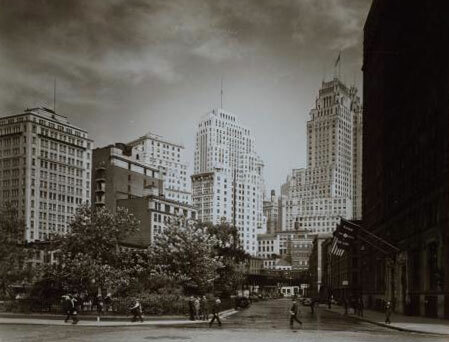 On the right (unseen) is One New York Plaza. Basically Maggie's house was torn down to make room for the large open terrace that is the entrance to One New York Plaza. The terrace is bare of a single plant or tree. There are no benches or places to sit. It is an open space void of any charm or amenities. Margaret Walsh was born on June 12, 1899 at 208 East 80th Street to Joseph Walsh, laborer, age 24, born in Ireland and Margaret Langan Walsh, age 23, born in Ireland. Margaret was third of three children. ( New York City Birth Certificate, 1899 #2230). Margaret married Louis Petersen circa 1942. New York City Archives are only available to 1937 as of 2014. Peggie Goehle Edgar told me in November 2005 that Margaret lived with Lou for at least 20 plus years before they married. They did not marry until after his mother had died. With her parents up to 1920. She worked as a secretary for several brokerage houses. She became a minor New York celebrity in the mid 1960's for her fight to preserve "Historic Old New York" and prevent her little house at 16 Moore Street, which dated from before 1732, from being demolished to build new office buildings. Margaret and Lou had no children. WWI: Peteresen, Louis Walter 616,105, 547 Carlton Ave. Brooklyn dob July 3, 1897, Btry C 32 Art CAC to disch, pvt, honorable discharge Dec 5, 1918, enlisted October 25, 1918, . 1940: West 137the Street Mae Peterson	68, widow, renting, high school 1st year, Francis Peterson	43, single, salesman trader, investments, college 2nd year, Louis Peterson	41, single, Statistician investments, college 2nd year, Evelyn Pathebone, 21 single, stenographer, lodger, 1945 Death of Mary Petersen: Mary Petersen Age 74, March 2, 1945, Bronx, #2380.